Buick has been suffering from an identity crises for the last 30 years. The switch from rear-wheel drive bigger cars to smaller front-wheel drive cars due to the federally mandated Corporate Average Fuel Economy (CAFE) standards in the 1980s and 1990s has not been kind to Buick in the last 30 years. If it was not for the early bird special crowd and the Chinese (Buick is a very popular auto brand in China), GM would have pulled the plug on this division just like it did on Oldsmobile and Pontiac. Back in the heyday of the U.S. auto industry the top of the car food chain was the Cadillac. And one notch right below Cadillac was Buick. Driving a Buick was a sign you had climbed the socio economic ladder. And then there were those that could afford a Cadillac but instead opted for a loaded Buick Electra which offered about 90% of the luxury amenities of a loaded Cadillac Fleetwood (Cadillac’s full-size luxury flagship at the time), for a much more reasonable price. During these years it seemed Oldsmobile with its luxury barge – the 98 which also was only one notch below the Cadillac Fleetwood was the Buick Electra’s biggest competitor. The Buick Electra name has been gone for over twenty years (1990 was its last model year), which probably has been a good thing since it had lost some of its appeal since 1985 when the Electra was moved from GM’s full-size C-body rear-wheel drive platform to the much smaller front-wheel drive H-body platform that was two feet shorter in length. In 1985 Electra buyers still wanted a full-size Baby Ruth candy bar and GM instead gave them a tootsie roll size Buick. So it was probably a good thing that Buick retired the Electra after the 1990 model year, to not further degrade the Electra’s name. Oddly the 1985 Electra did sell well (with a nice sales increase over 1984) and was a very profitable car during the 1980s for Buick, however GM with its shortsighted move of its full-size C-bodies to the smaller H-body platform in 1985 in the long term proved fatal. It left Buick and Oldsmobile without a rear-wheel drive flagship luxury car during the late 1980s. By 1990, Electra sales were way down when compared to 1985. GM did realize its mistake and released the full-size rear-wheel drive 1991-1996 Buick Roadmaster, however the final product appealed to the senior citizen crowd and not the upperly mobile professionals who once bought Electras. Ironically Buick currently produces a world class luxury full-size flagship rear-wheel drive car called the Park Avenue. Currently the 2013 Buick Park Avenue is available in China but not in the U.S. And with GM recently trademarking the "Electra" name, has led to some rumors that the rear-wheel drive Park Avenue will make it here to the U.S. with Buick renaming the car the "Electra" and adding V8 power (the Park Avenue currently is only available with a GM’s direct injection 3.0 liter V6 in China). The soon to be released full-size V8 powered 2014 Chevrolet SS here in America is helping to fuel the rumors of a new V8 powered rear-wheel drive Electra, which would help fix Buick’s current identity crises. Unfortunately the odds are currently against this happening due to the ever-tightening CAFE standards. Most auto historians will probably agree that 1976 was the greatest height during the Electra’s history. This was the last year of the jumbo size Electra, a true six passenger full-size vehicle that with a length of 233.3 inches, width of 79.9 inches, and wheelbase of 127 inches is about a foot longer than the current mega sized Chevrolet Suburban which has a length of 222.3 inches. The 1976 Electra may have been big however it was shapely. With plenty of curves and unique lines, this big battle cruiser was a work of art. After 1976 never again would a full-size Buick be as distinctive and have such independent styling when compared to its GM C-body cousins the Oldsmobile 98 and Cadillac Fleetwood. 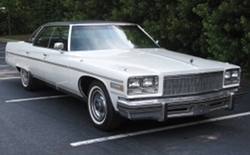 Each of these three cars were so distinctive in 1976 that a Buick Electra had as much resemblance to the Oldsmobile 98 and Cadillac Fleetwood as a Lincoln Continental or a Chrysler New Yorker. The Buick Electra just like the 98 and Fleetwood had its own distinctive tailfins. The tailfins on most cars disappeared a few years into the 1960s, however they remained (in a more understated fashion) on the big GM C-bodies and by 1976 they were still easily visible. Cadillac would keep the tailfin design on its cars throughout most of the 1990s however Buick and Oldsmobile would drop them on the Electra and 98 in the mid-1980s. 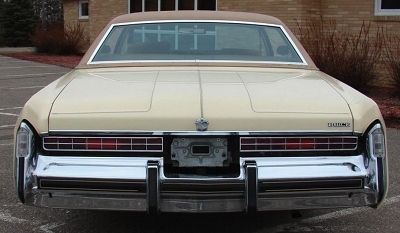 The Electra had received quad square headlamps starting in 1975 which carried over to the 1976 model year. The big change was the very large front grille from 1975 which extended from the middle of the front-end to each end of the front-end under the quad headlamps was history. Instead the grille stayed in the center of the front end and the parking lights which had been mounted inside the large front chrome bumper for 1975 moved under the quad headlamps for 1976. 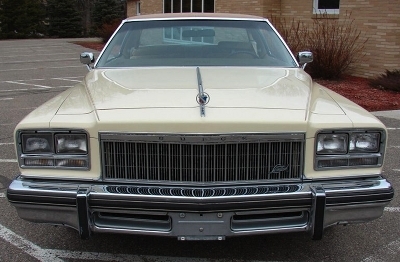 The overall look of the front-end was much cleaner and more attractive than 1975, it was a look that Buick would continue to use on the next generation (1977-1984) Electra with much success. The rest of the car was essentially a carryover from 1975, even the familiar hood ornament was there along with the famous Buick portals (which by this time were now rectangular) on the front quarter panels. The rear-end was an exact duplicate of the 1975 design, and with the attractive long rectangular taillamps surrounded by lots of tastefully designed chrome. The shape was very long and flowing, on both the 2-door coupe and 4-door sedan Electra – these were the type of long flowing elegant lines only a very large car could have, which will probably never be found again on a new car because future cars will never be this large again. Also adding to the appeal of the Electra was the semi-fastback style roof line, which gave it a futuristic look. With the 4-door sedan, very nice small opera windows were standard right behind the rear side windows – not only was this a nice luxury touch but it eliminated the big blind spots found in these areas on the 1971-1974 Electra. The 2-door coupe had even larger side opera windows. Buick had the building big car game, down perfectly with the Electra. Buick understood when you had a large car that weighed in at close to 5,000 lbs, a large displacement V8 with loads of torque was not only desired but a must. 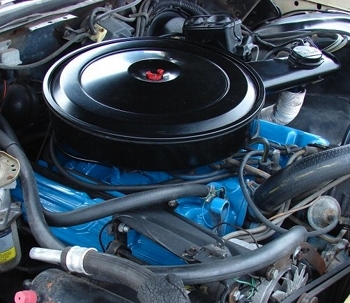 Buick could have caved into the times and offered it’s small-block 350 CID (5.7 liter) V8 in the 1976 Electra, instead it took a no compromise approach and offered the large displacement 455 CID (7.5 liter) V8 from its big-block V8 family. Buick thus again could have caved in and offered the 455 V8 with only a 2-bbl carburetor. Fortunately Buick would have no part in such a compromise, it offered the 4-bbl 455 V8 as standard in all Electra models. At least that was the plan anyway since the 1976 Buick sales brochure shows the 4-bbl 455 V8 as the Electra’s only available motor. With circumstances beyond its control, 455 V8 production fell short for the model year so Buick offered the 4-bbl 350 V8 as a rebate/delete option. Not many 350 V8 powered 1976 Electras were produced, so they are a rarity when they are found. Ironically 1976 would be the last year for the Buick 455 V8, it was just too thirsty to meet the late-1970s CAFE standards. For its last year the 455 V8 produced 205 horsepower which was a lot lower than a few years prior. The addition of pollution control devices, along with compression ratio drops, and a stricter horsepower rating system all were factors in the 455’s horsepower drop. However the really good news was the 455 produced 345 lb-ft of torque – all of which was available at the lower rpm range providing plenty of pulling power to move the heavy Electra around town effortlessly. The 350 V8 as you would imagine didn’t do the task as well as the 455, since it had a horsepower rating of 155 and a torque rating around 280 lb-ft of torque. However the 350 was at least 20% more fuel efficient, so for those buyers who preferred better fuel efficiency the loss in horsepower and torque with opting for the 350 wasn’t a bad tradeoff. The Buick 350 would remain in production through the 1980 model year. Both the 455 and 350 would have the new High-Energy Ignition (HEI) system as standard. HEI provided improved spark to each individual spark plug improving engine fuel efficiency. HEI also required less maintenance and spark plugs change intervals went up to every 24,000 miles. As with any luxury car back in the day, picking the right trim level was imperative. Most luxury cars had a comfy base luxury level, then an optional more upscale luxury trim level. Buick with the 1976 Electra took it one big step beyond what was expected of a luxury car and offered three distinctive trim levels. 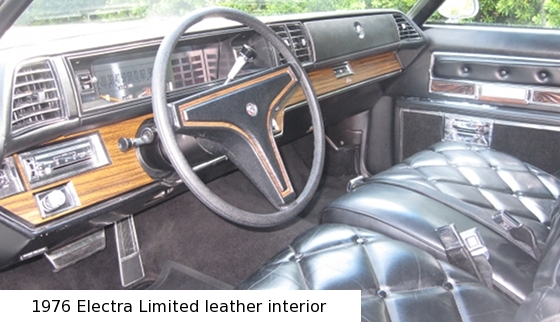 The base Electra trim level for both the 2-door and 4-door was the Electra 225 which offered an attractive vinyl or cloth interior which was on par with the interior of the 1976 Chevrolet Caprice which was Chevrolet’s most luxurious full-size car. 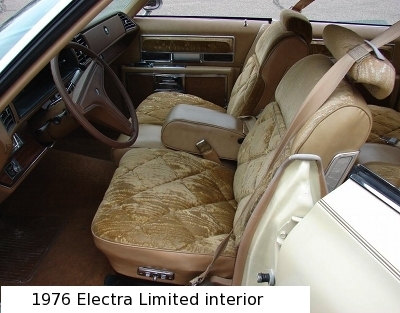 Next up the luxury scale was the Electra Limited (available on both the 2-door or 4-door Electra) which included pillowy plush seating surfaces in either cloth or leather. The 225 and Limited trim levels would have been enough to keep Electra customers happy however Buick offered another trim level – the Limited Park Avenue which was a big leap above the Limited package and was on par with the Cadillac Fleetwood’s Talisman trim package (the Fleetwood’s top luxury trim package at the time), with the plushest and softest cloth interior you were going to find in a luxury car at the time. It was an interior fit for a king. 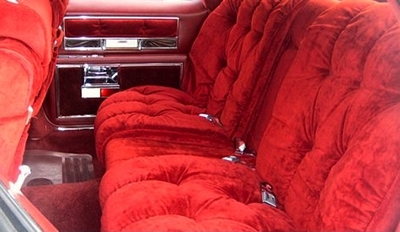 And when ordered with the optional plush front console (which was standard when the 40/40 seat configuration was ordered on the Park Avenue versus the standard 40/60) this package made the interior look like the most regal living room couch. The interior cabin of the Electra appeared to be as large as a big living room. There was so much headroom, shoulder room, and especially leg room that no matter where you sat in this car you felt as if you were confined to your own little oasis of comfort. And for passengers in the back seat, the room was so plentiful that it was like a stretch limousine ride. And when the trunk was open – it was wow what can’t fit in a little over 20 cubic feet of trunk space. It was not what options did the Electra have, but what didn’t it offer? Everything from an electric powered Astroroof to an electronic trunk release and even an automatic climate control system was on the option list. One standard item was the beautiful rectangular speedometer with silver background and oversized numbers. Anyone who usually sits behind the wheel will comment on how attractive this speedo is. 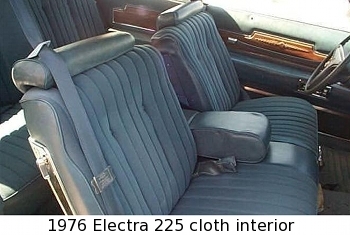 Just about every imaginable option that 1976 had to offer was available on the Electra. 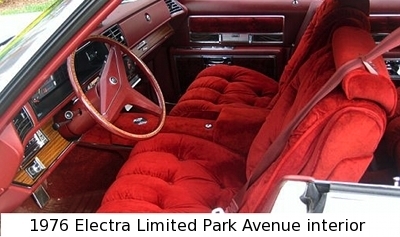 A loaded 1976 Electra in 2012 would still please most luxury car buyers it would have all the power and convenience options that they would demand. The hardest part a modern luxury car buyer would have acclimating to the Electra would be getting used to maneuvering around in tight parking spots with such a big car and the ultra cushiony ride which even the bigger cars today don’t have. Ironically the ultra mega-sized 1971-1976 C-bodies were slated by GM to be downsized to a more manageable size before the 1973 Oil Crises, so the 1976 Electra would have shrunk even if fuel had remained low throughout the 1970s. The 1976 Electra was like the Titanic, it was massive. The Titanic was the most luxurious vessel you were going to find in the early 1900s. Same was true with the Electra, it was the best 1976 had to offer. Right before the 1976 production model year ceased, the Titanic in the form of the massive Electra had its last cruise. Never again would America see a new production car that big. Even the full-size Lincoln and Chrysler which would linger on as massive cars for a few more model years were not as big. And when the 1976 Electra passed on, Buick seemed to have lost some of its soul, for never again would a car be this big and majestic.